IMT, Inc is more then a labor broker. 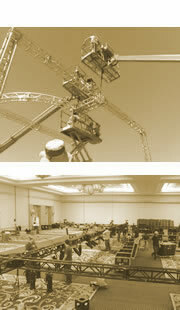 We offer intelligent, accurate, complete labor solutions and event management based on comprehensive experience. We have provided Corporate labor for an extraordinary range of events and developed relationships with an extensive array of clients. IMT takes tremendous pride in hiring Audio, Video and Lighting Technicians as well as highly skilled Carpenters to formulate a very talented team. In addition, we have a crew of freelance technicians at our disposal. We pride ourselves on our division of labor capabilities in order to perform the necessary tasks as quickly and efficiently as possible. We are self-motivated and exhibit a strong work ethic, necessary attributes of a crew due to the highly competitive nature of the industry. We must maintain a high level of professionalism in order to stay ahead of the pack.